Bloomberg experts claim that the day of reckoning for cryptocurrency funds has finally come. Last year, when the world’s first digital currency (Bitcoin) went sky-high in mid-December and reached another all-time high at 20000 USD/BTC, over 150 funds specializing in cryptocurrencies emerged on the Internet. In 2017, theirprofitsreached 1000%. 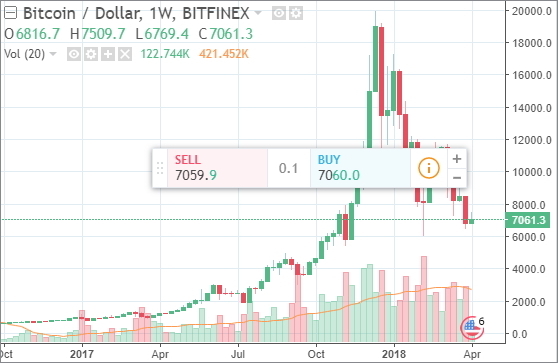 By now, the BTC exchange rate has dropped by almost 70% below 7000 USD/BTC, which is the lowest level since November 2017. Apparently, this means significant loss of profits for those funds. There is no denying the fact that these days investors will think twice before investing in cryptocurrencies. The inflow of investment capital has slowed down considerably, even in such respected funds as Multicoin Capital, which is confirmed by their founders. Founded in August 2017, when the interest in Bitcoin was peaking, the mentioned fund managed over 50 million dollars in assets. It’s interesting to note that since then, at least 9 cryptocurrency funds have ceased to exist and deleted their Facebook and twitter accounts. One of those funds named Alpha Protocol reasoned their decision by saying that taking into account potential regulatory and market risks, the best option would be to refund those investors who participated in the ICO. At the same time, other funds have been cutting down on their market activity and reducing their market exposure. For example, back in September 2017, Polychain Capital used to run some 250 million dollars in assets. In January 2018, it rejected the listing in Canada. Famous currency market player and billionaire Mike Novogratz refused to create his own crypto-fund. Instead, he decided to create a bank working with blockchain-based startups. According to Rick Marini from Autonomous Research LLP., up to 10% of hedge funds currently investing in cryptocurrencies will have to close till late 2018. The reason has to do with the difficulties to attract enough external funds required to service institutional investors.